Do you have some questions? Well, you've come to the right place. Here is a list of some of the most common questions we hear from our customers. This page contains answers to frequently asked questions and general information about our products and services. Take a look and see if you find what you're looking for. Intraday trading or day trading means buying & selling of the stock on the same day. Swing Trading is a short term trading method that can be used when trading stocks and options. Whereas Day Trading positions last less than one day, Swing Trading positions typically last two to six days, but may last as long as two weeks. Is there any trading guide for beginners? To learn about technical analysis and trading in general please refer "Trading Resources" section of our website. What technical indicators can I use to find undervalued stock? Accumulation/Distribution Line: An upward trend shows increasing buying. Even if the price of a stock is moving sideways, an increasing A/D line shows that the stock was being accumulated. ADX: Measures the strength and momentum of a trend. Because ADX is non-directional it doesn’t show the direction of the trend, which is why investors typically plot two other indicators alongside ADX. Values above 20 indicate that a trend is increasing, while a value of 40 indicates that a trend is exhausted and may reverse. Aroon Oscillator: Used to determine whether a stock is in a trend, and how significant that trend is. The higher the number, the more bullish the predictor is. An investor may consider an increasing value a sign that a stock is potentially undervalued. Is there any tool through which I can know amongst all the sectors which one is outperforming? Use our tool ‘Performance Chart’. Select the Chart Type and add the sectors. Highest Line will the outperforming sector and lowest line will be the underperforming sector. Also if you are consider NIFTY as a benchmark index then the sector line above the NIFTY line are the ones who are outperforming whereas below the NIFTY line are the ones who are underperforming. What are some common momentum oscillators used in options trading? Option traders look to volatility and trend strengths because of the time-sensitive nature of options; there are no buy-and-hold strategies in options trading. Traders need to be able to assess the relative strength of their positions quickly and time their transactions efficiently. Bollinger Bands use standard deviations to highlight extremely overbought and oversold conditions even as volatility changes over time. Since volatility impacts options valuation, Bollinger Bands are popular for buyers and sellers. The relative strength index (RSI) compares recent price gains to recent price losses, potentially helping the options trader anticipate corrections and overbought/oversold levels. The RSI works best with liquid, flexible assets. The money flow index (MFI) is very similar to the RSI, but it places more emphasis on trading volume. How do we know which stock is outperforming to the NIFTY? Use Indicator ‘Comparative Relative Strength’. If green line is moving higher than the stock is outperforming the NIFTY. Comparative Relative strength can be useful for many purposes. A simple use is to measure the strength of a stock's current trend versus that of the general market. An alternative use is when comparing two potential investments and trying to determine overall which one has the strongest overall trend. Finally, you could use the comparison tool to help monitor the profitability of a pair trade. How to identify a trading range? Markets go through the cycle of expansion and contraction. Trading ranges represents contraction which should lead an expansion. Use indicator ‘Geometric Rectangle’. If prices are inside the Blue and Red Lines then the stock is trading inside a range. It shows the breakout & breakdown levels from where the stock can move in a direction. If the lines are not shown in the chart that means stock is in a strong trend. Is there any tool through which I can measure the volatility of a stock? Volatility refers to the amount of uncertainty or risk about the size of changes in a security's value. A higher volatility means that the price of the security can change dramatically over a short time period in either direction. A lower volatility means that a security's value does not fluctuate dramatically, but changes in value at a steady pace over a period of time. Use indicator ‘Bollinger Bands Width’. If the red Line is moving higher than the volatility is rising and if the Red Line is moving lower than the volatility is cooling off. This alerts traders to prepare for a move in either direction. Is there any tool which I can use as a trailing stop? • Very loose stop loss. • Spend maximum time in the trade. • With a Long term View (It will triggered in a deep correction). • Less tight stop loss. • Giving advantage of full rally (upward or downward). • Very effective in a Weak uptrend or downtrend. • Very tight stop loss. • Take away you very early from the trade. • Very effective in a trending market. Is there any tool which I can use as a target? Use our strategy ‘TA Forecast’. The box represents the expected target. Blue Box is for the long trades whereas purple box is for the short trades. (a) Where a stock price can go (Target). The vertical lines of the box represent the range of the stock price i.e. a stock can reach between these price levels. (b) When the target can be reached (Time period). The horizontal lines of the rectangle represent the range of the time i.e. when a stock price can make a high or low. How do I give ranking to the sectors? Use our tool ‘Live Grid’. Open Live Grid. First chose data type. Then select the sector folder. You can also compress the data interval on a higher timeframe which you have selected. At last select Rank from the setting. Now click on Go. A gird will be open. In the Rank column you will find the ranking of each sector. The green colored ranking suggests an increase in Rank whereas Pink colored ranking suggests a decrease in ranking. Can I track my position, profit and loss in Trend Analyser? We have a tool ‘Portfolio Manager’. You can track multiple portfolios there. First you need to create a portfolio. Then add your position in it. You need to fill all the trade details like Stock Name, Buy/Sell Rates, Volume, Stop and Target. You can also put your important notes about the trade. How do I know when prices are trading near the entry point in Trend Analyser? • A pop up message appears on the screen, whenever the condition specified in the alert is met. • Queries can also be included in the alert. • Alert runs in background. • It allows user to create customized alert based on different alert types. • There can be only one alert per company. • Alerts can save as file for later use. How do I recreate a complete real-time market picture? Trade simulations can playback market data at different speed. You have complete control over the speed of the market data to be displayed. Note: To watch chart simulation the chart must be opened. Please click on order page. Here you will get a good idea about our products and pricing. Once you shortlist your product purchase, just add it to the cart and proceed to the checkout page. On the checkout page, you have an option of 2 payment gateways and where you can also review your order. (If you have any coupon, you can apply that). Having reviewed your order to satisfaction, you may now make the payment. We accept Credit card, Debit Card, Net Banking, Cash & Cheque, thus payment can be made using any credit card, debit card or net banking. You can also make the payment by using variable payment section of our website. How much time it takes to activate account after payment? Debit Card/Credit Card: To have your account activated fast, we recommend using Debit Card/Credit Card payment option. Cheque/DD: Cheques/DD payments take around 48 hours to realize the payments once we receive the cheque/DD. Internet Banking: Usually takes between 48 and 72 hours to realize the payment. Please note: The above approximate realization times are given to help you make a decision on the payment option to choose. S2 Analytics does not guarantee the above realization times as they are done solely at the discretion of the banks involved in the transaction. What is the renewal procedure? Login to your S2 Analytics Account. Go to “My Subscriptions” menu. The table shows your subscriptions list. Here you will get order summary, order details and invoice etc. You can also renew your product directly by clicking on icon i.e. Renew Your Subscription. How can I check my subscriptions? Is there any free-trial? If yes, how can I avail that? Free trial / demo activation allows users to use our products for free of cost for during a limited period of time. They can use the services, benefit from all the features, for free. You can activate your demo by registering with us. If due to any reason you are not able to use our service or you are not satisfied or you wish to suspend the services or subscription of our products, the company is not liable to refund you any amount for your non-usage of the service or against such cancellation or suspension, however you can adjust such amount against our any other products or services. You can get support from us through multiple channels such as email, phone, message center and remote support. Message center is our inbuilt tool that allows you to send and receive messages from us. This is present in all of our products. Through remote we access your computer remotely and solve any problems you may be facing. We can also help you understand our product by talking you through it. My Account gives you quick access to products, tools & settings. Here you will get details related to your profile, your subscriptions; demo, seminar, referral, calendar, announcements, support & settings. Click on “forgot password” link from login tab. Enter your email Id. Your password will be sent to your email id. Go to your mailbox and reset your password. When I click on "Forgot Password" link, I do not get the email from S2 Analytics? First check if you are using your correct email ID for logging into your S2 account. If yes and you still do not receive the password reset email, please check your spam folder. If you are still unable to locate it, contact our support team at support@s2analytics.com. How to change personal and contact details. Login to your S2 Analytics Account. Go to “My Profile” menu. Here you can change your personal details, contact details & additional contact information. Login to your S2 Analytics Account. Go to “My Subscriptions” menu. The table shows your subscriptions list. In "Action" column, you will get order summary, order details and invoice etc. You can also renew your product directly by clicking on icon i.e. Renew Your Subscription. Login to your S2 Analytics Account. Go to “My Subscriptions” menu. The table shows your subscriptions list. In "Action" column, you will get order summary, order details and invoice etc. You can download the invoice by clicking on icon i.e. Download Invoice. How to check expiry date of my demo activation? Login to your S2 Analytics Account. Go to “My Subscriptions” menu. The table shows your subscriptions list. In "Action" column, you can view expiry of your subscription by clicking on icon i.e. View Details. You can also check expiry of your subscription by click on profile menu of your active product. How I can track status regarding payment and reservation of seminars? After logged in to your S2 Analytics account, go to “Seminar” menu. This page shows list of past and upcoming seminars. Your status regarding payment and reservation will also be shown. The referral program allows you to invite people to try and buy our products. Every person you invite can use your referral code to avail discount. You also benefit as you get credits which you can use when you purchase or renew a subscription. How to generate invoice on company name? You can mention the name of your company in "My profile" menu and from "Settings" you can select option to generate invoice on company name. What is "De-activate account" ? How do I deactivate my account? Deactivation means permanent deletion of your account with S2 Analytics. If you decide not to use our services at all and do not wish to be contacted by us then you can de-activate your account. Once you deactivate your account, you’ll no longer be able to access any information. 2. Click on Sign up, then signup form will appear. 6. Once OTP is verified, your account will be created. 7. You can login by using your login credentials. What is difference between login and quick login? Using login tab, you will be able to access the entire website including access of product. Whereas quick login enables user to access the product directly. How to compare suitable products? You can visit "Compare Products" section of our website. This section will help you to understand the important features of our products and may help you in deciding which product is right for you. How to make payment of seminar? Seminar page enables you will find details of upcoming and past Seminars. If you wish to attend any upcoming seminars please click on the "Enquire now" button. You can make the payment by using variable payment section of our website. After logged in to your S2 Analytics account, go to “Seminar” menu. Your status regarding payment and reservation will also be shown there. We seek long term partnership with individuals and institutions as well, which is enduring and mutually beneficial. You can get associated with us. Feel free to contact us by sending us an e-mail or calling between business hours or by filling up the form prescribed at dealership section. We are always happy to hear from you. Please feel free to call us at 011 42563333 or fill the CONTACT US form. Trend Analyser is a professional charting and analysis software that comes with state-of-the-art tools to determine trend, momentum, buy and sell points for stocks. It is critical to have the right charting software to trade on the stock, futures, and other financial instruments. The right software can give you an edge in today’s competitive markets. 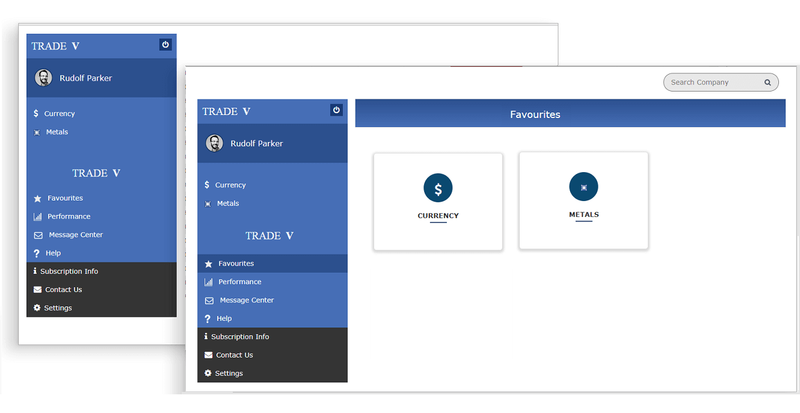 Our product ‘Trend Analyser’ has been developed keeping all the key ingredients in mind such as trading tools, data management, ease of use and performance. 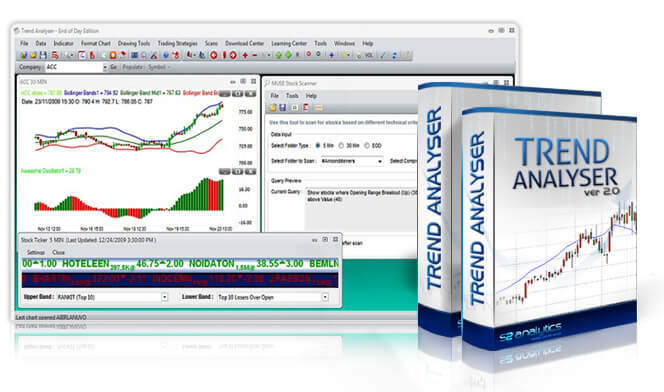 Trend Analyser is windows desktop software. Currently it supports only windows systems. Note: Internet connection is required to use the product. How can I get user manual of this product? You will get complete product overview and user manual in the help section of this product. 1. Click on File menu. 2. Click on Open menu. 4. An Open Company dialogue box will appear. 5. Select the appropriate tab for which you want to create chart. 6. For Real-time future data select 5min. 7. For Cash data select 30min. 8. For End of Day data select EOD. 9. For virtual & custom folders select Folders. 10. Select the company from the list. 11. Click OK to create new chart of selected company. Can I get a trial version of the product? Free trial / demo activation allows users to use our products for free of cost for during a limited period of time. They can use the services, benefit from all the features, for free. You can activate your demo by registering with us. Please note that if the last time you tried demo for a product was 4 months before the current date then you can try the demo again. Trade V gives positional buy/sell signals for stock futures, indices, currency, metals and equities. The signals are positional and valid for up to 1-3 days for most segments and around 4 - 6 days for equities. Downloads page shows the platforms supported by our products. You can click respective icon to download for a specific platform. 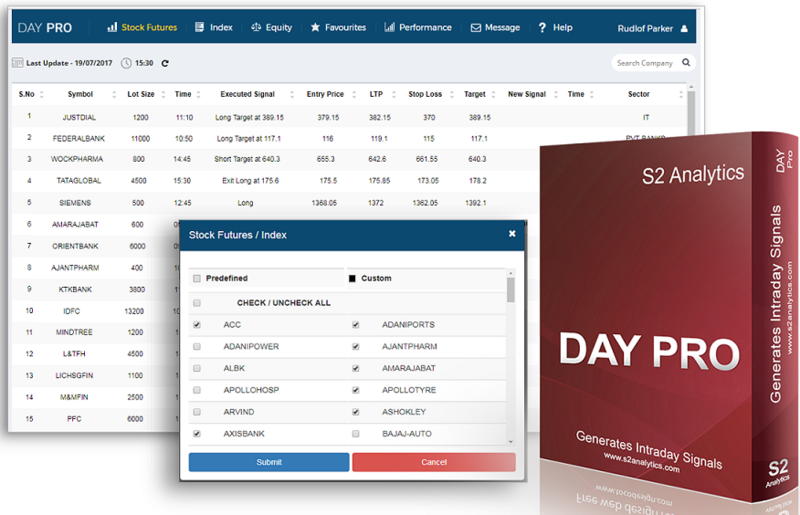 Day PRO generates intraday buy and sell signals for NSE stock futures, indices (Nifty and Bank Nifty) and equities. There is a version dedicated to equities as well. The product is available as a web version, windows desktop program and as a mobile app. A bucket is another name for group of stocks. In this product we have carefully selected stocks that make money consistently and have created buckets. You can trade those buckets thus freeing you from choosing specific stocks. How to check companies in the bucket? In favourite section, you can select bucket to view the stocks by clicking on manage favourite. Newsletter is available for short term trading and medium term investment. Our short term newsletter contains market analysis, index views, stock recommendations and more. This newsletter is given every trading day and the focus is on short term trading. Investment Letter is released twice a week and gives medium term stock recommendations. This is suitable for those who wish to invest money in equities.